They aren't the first animal you would think of for comic interest, but goats can be a treasure-trove of amusement. They have the unusual mix of being kind of dumb in some ways, but endlessly inventive and persistent in others. If you have ever owned a goat, or know someone who has owned a goat, they will confirm this strongly, and may even tell you with a few stories of the unbelievable things their goat did over the years. What does this have to do with drawing? A heck of a lot -- and it has everything to do with cartooning. Any art benefits from interest, and funny art sells. Goats are funny. If you can capture their adventures and misadventures properly, people will buy it (especially in rural areas or vacation towns). But if you are a budding cartoonist, you really, really need to know how to draw a good goat. There are a lot of similarities between goats and horses, and the similarities increase between goats and young horses, known as colts. Goat bodies are slighter, thinner than horses. Goats also have cloven feet, unlike horses, and, or course, they have horns. Do note, though, that not all goats have horns, and not all goats have goatees (the shaggy tuft of hair that comes out below their chin). 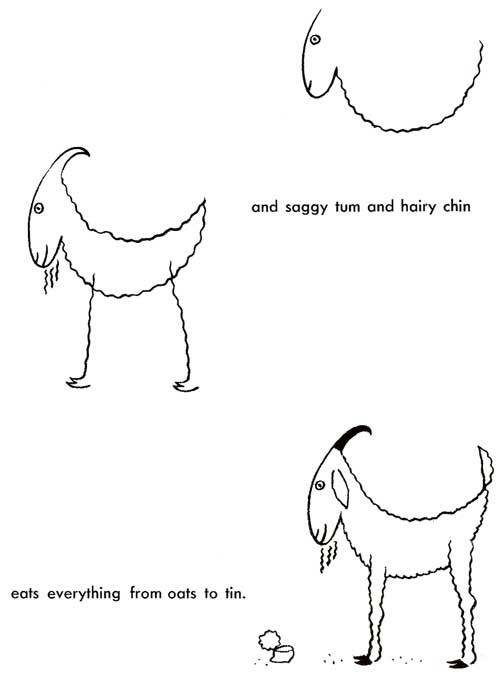 Another way to draw a goat.